The Indian automaker has spent a lot of time in making the cabin of the Tata comfortable, convenient, premium and appealing. You need to climb into the cabin since it has a healthy 208 mm of ground clearance. Surprisingly the interiors feel very plush in this Tata. The instrument cluster gets a big multi-information display. The height adjustable and leather wrapped steering wheel integrates controls for the infotainment system and cruise control system. It doesn’t offer push button start/stop feature but there are automatic headlamps and rain sensing wipers. The overall quality, fit and finish feels great and there is good attention to detail inside the cabin. The centre console comes with a neatly integrated ConnectNext infotainment system which is designed by Harman. It offers a 10-speaker JBL audio system including a sub-woofer and power amplifier. The sound quality is super rich and unrealistic for this segment. There is a 5-inch touch screen display that offers good touch quality but is a tad small in size. It comes with extensive smartphone integration with ConnectNext Apps. These apps let you access navigation, create a mobile hotspot for sharing music, change the mood lighting of the car with 8 colour options and access the digital manual of the car. However, these apps are only available for Android devices for now. Other features of the infotainment include USB, AUX, Bluetooth connectivity along with voice recognition, navigation, on-screen SMS display, SMS readout and rear view camera display with parking guidelines. The Tata Hexa comes with automatic climate control and dual air conditioning for the front and rear passengers. For quick cooling in all three rows, it gets rear AC vents on the floor console and on the B and C pillars. The seats are very comfortable and supportive having ideal cushioning for your back and under-thigh support. There is an option of captain and bench seats for the second row. The legroom and headroom is excellent even for the tall passengers. You get window blinds in the second row that adds to the comfort in bright sunlight. The third row of seats are practical as well but on long drives it might get a bit tight for adults. You get power sockets for all three rows. There is ample amount of storage spaces in the car to keep the cabin neat and tidy. All three rows get bottle holders while the last row gets an additional cooled compartment. The seats are very flexible so you can fold down the third and second row of seats to enhance the luggage space. 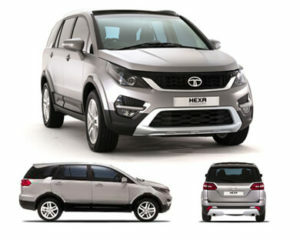 Hexa is offered in manual six-speed and automatic six-speed options. While the former comes with “Super Drive Modes” for surface-specific options, the automatic Hexa was tested for this review. And it was an absolute breezeThe Hexa automatic offers a no-fuss, no-fancy drive with power coming up in a decently linear manner. No, it is not zippy but then, it would be unfair to expect a car this big to whizz around in city traffic. What is good though is that it moves in a leisurely enough manner in city traffic to ensure one doesn’t miss out on those important meetings. Push the pedal harder and there is that slight sound of a muffled diesel gruff but on the whole, the Varicor 400 engine does a fantastic job of keeping itself composed. This and the extremely-well insulated cabin ensure that the crudeness of diesel experienced on most cars is disguised.Where the Hexa does lag is in speeds well over three-digits. While getting there is no problem at all, the steering system sends back minor yet very noticeable vibrations – enough to make the slightly jittery driver even more jittery. This was experienced each time the car was taken well past 110kmph in this review.